Goldfish are prone to a number of illnesses that can impact their swim bladder, the small sac located in the fish's abdomen. The swim bladder is responsible for the fish's buoyancy; any changes to the organ can make it difficult for the fish to swim to either the bottom or top of his tank. Consult a veterinarian if you suspect something may be wring with your pet's health. Bacterial infections can affect the proper functioning of the goldfish's swim bladder, causing him to float, sink or struggle just to stay right side up. For cold-water fish, which goldfish are, the condition of the water in their tank can be linked to the onset of bacterial disease. Water that is too cold, for example, may cause a fish stress, making him more susceptible to disease. A constipated goldfish will become bloated, and the impacted food will interfere with the swim bladder's ability to maintain proper buoyancy. According to PetPlace.com, the more rotund goldfish varieties, such as orandas, lionheads and ryukins, are more susceptible to constipation than others. If constipation is thought to be the cause of the buoyancy issues, a change in diet is likely in order. Some goldfish are predisposed to suffering from buoyancy problems due to their genetic makeup, much the same way many human diseases have a hereditary link. According to Sylvia Animal Hospital, the fancy goldfish species, including the fantail, are anatomically different than the common thin-bodied goldfish and are therefore more apt to have abnormal swim bladder function. A genetically impaired swim bladder cannot be treated. Although they are rare, tumors cause goldfish buoyancy problem. 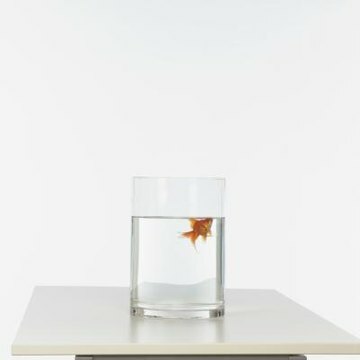 According to FishChannel.com, any shift in the density of a goldfish, even the presence of a tumorlike growth, can cause the fish to lose his balance and begin to sink or float. The instability can become worse when the fish eats or as his swim bladder becomes naturally compromised over time, making him unstable in the water for greater periods of time. Swim bladder is not just the name of the organ; it's the common name for the broad range of ailments that cause buoyancy problems. To do your best to help prevent the onset of the disease, soak your fish's food pellets or flakes in water prior to serving to allow for expansion outside of his abdomen, which can decrease the chances of impaction, according to NetPets. If you suspect the disease is already present and your fish is impacted, fast him for a couple of days to see if the condition cures itself. Another method commonly used to treat impaction is to offer your fish a thawed, skinless frozen pea. The veggie is said to break up impaction. How Can You Help a Koi Carp That Has Popeye?